Just like with your website, you need to think carefully about the content and structure of your mobile website before you begin to build. Mobile sites are used differently than traditional desktop websites. Your mobile site should be more "call to action" oriented as users on the go are primarily looking for a telephone number so they can call you, looking for your address (map) so they can see where your store is located or looking for a mail address or e-mail form so they can send you a message. The secondary purpose of a mobile website should be to give information about your company and your products or services. 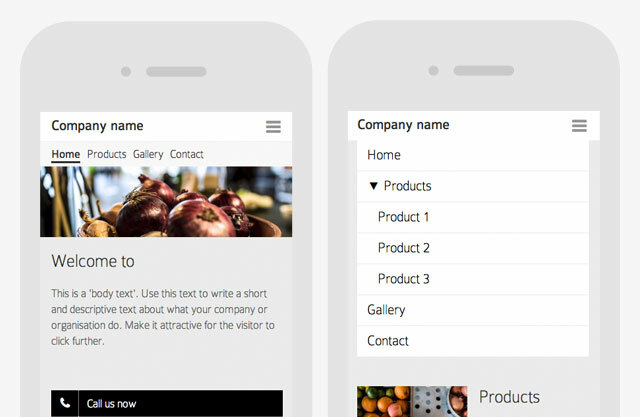 With the above in mind, you can start building your mobile website in mono. If your website consists of only a few pages you may want to choose a visible menu located at the top of the page. This option limits the number of high level menu pages because it is not as wide. If you have several high-level menu pages and/or perhaps many inner pages, you should use the menu list option. Upon pressing the menu button a drop down will appear with all the pages.